Steps forward in the search for life beyond Earth can be as simple as sending a balloon into the sky. In one of the most unique and extensive eclipse observation campaigns ever attempted, NASA is collaborating with student teams across the U.S. to do just that. A larger initiative, NASA’s Eclipse Balloon Project, led by Angela Des Jardins of Montana State University, is sending more than 50 high-altitude balloons launched by student teams across the U.S. to livestream aerial footage of the Aug. 21 total solar eclipse from the edge of space to NASA’s website. 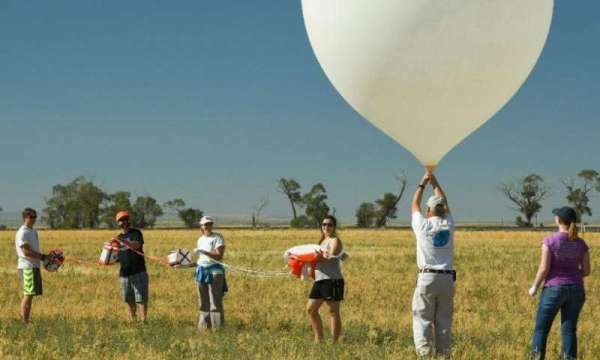 A research group at NASA’s Ames Research Center, in California’s Silicon Valley, is seizing the opportunity to conduct a low-cost experiment on 34 of the balloons. This experiment, called MicroStrat, will simulate life’s ability to survive beyond Earth—and maybe even on Mars. NASA will provide each team with two small metal cards, each the size of a dog tag. The cards have harmless, yet environmentally resilient bacteria dried onto their surface. One card will fly up with the balloon while the other remains on the ground. A comparison of the two will show the consequences of the exposure to Mars-like conditions, such as bacterial survival and any genetic changes. The results of the experiment will improve NASA’s understanding of environmental limits for terrestrial life, in order to inform our search for life on other worlds. Mars’ atmosphere at the surface is about 100 times thinner than Earth’s, with cooler temperatures and more radiation. Under normal conditions, the upper portion of our stratosphere is similar to these Martian conditions, with its cold, thin atmosphere and exposure to radiation, due to its location above most of Earth’s protective ozone layer. Temperatures where the balloons fly can reach minus 35 degrees Fahrenheit (about minus 37 Celsius) or colder, with pressures about a hundredth of that at sea level. During the eclipse, the similarities to Mars only increase. The Moon will buffer the full blast of radiation and heat from the Sun, blocking certain ultraviolet rays that are less abundant in the Martian atmosphere and bringing the temperature down even further. Beyond the opportunity for NASA to conduct science, this joint project provides the opportunity for students as young as 10 years old to be exposed to the scientific method and astrobiology—research about life beyond Earth. Since ballooning is such an accessible and low-cost technique, the project has attracted student teams from Puerto Rico to Alaska. The data collected by the teams will be analyzed by NASA scientists at Ames and NASA’s Jet Propulsion Laboratory, Pasadena, California; collaborators at Cornell University, Ithaca, New York; scientists funded by the National Science Foundation and National Oceanographic and Atmospheric Administration; faculty members and students at the teams’ institutions, as well as the public.